Ingredients for cooking Vegetable Soup Peel and finely slice the onion and crush and chop the clove of garlic. Put a tablespoon of vegetable oil in a large frying pan, and gently cook the onion and garlic for 5 minutes or so, until the onion is nicely softened but not browned. Next, add a teaspoon or so of Garam Masala to the frying pan. 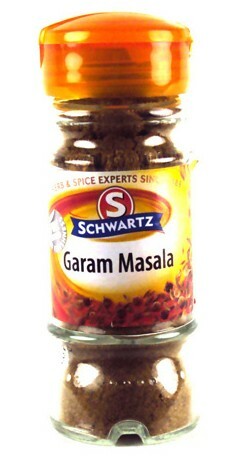 This, which is a fairly hot mixture of spices widely used in Indian-style foods. How much you use is up to you, but make sure the spice is added to the oil early in the cooking, so that the full flavour is brought out. Cook the spices for a minute or so, then add the vegetable stock cube previously dissolved in half a pint of boiling water. Bring to the boil, stiring continuously, then add the mashed banana. Turn down the heat and simmer for 20 minutes until all the ingredients have infused nicely. Meanwhile, hard-boil and peel the eggs following the instructions found here. Once the eggs are ready, disolve a teaspoon of cornflour in a little water and stir into the sauce. Bring to the boil so that the curry sauce is thickened. 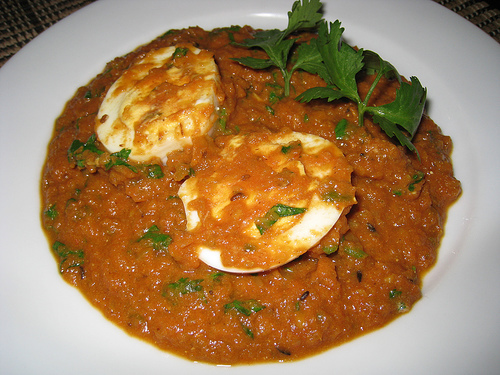 Remove from the heat, halve the boiled eggs and very gently stir the eggs into the sauce. Serve immediately with my flavoured rice and perhaps some naan bread on the side.